The volunteer efforts of Port Fairy's Goeff Coxall have been honoured with a Paul Harris fellowship. The Paul Harris fellowship recognises outstanding commitment to Rotary and the community. In presenting the honour to Geoff at the Club's recent meeting, President Sue Robertson said that Geoff's work exemplifies the humanitarian and educational objectives of Rotary. She congratulated him on the award and in particular highlighted his contribution to the Bandari Project that provides education opportunities for children in the Tanzanian village of Mto Wambu. President Sue also presented a cheque to Seif Sakate for a scholarship that will support a child to attend the Bandari school in Mto Wambu. Rhys Jansen of Romsey was the lucky winner of Port Fairy Rotary's summer raffle. 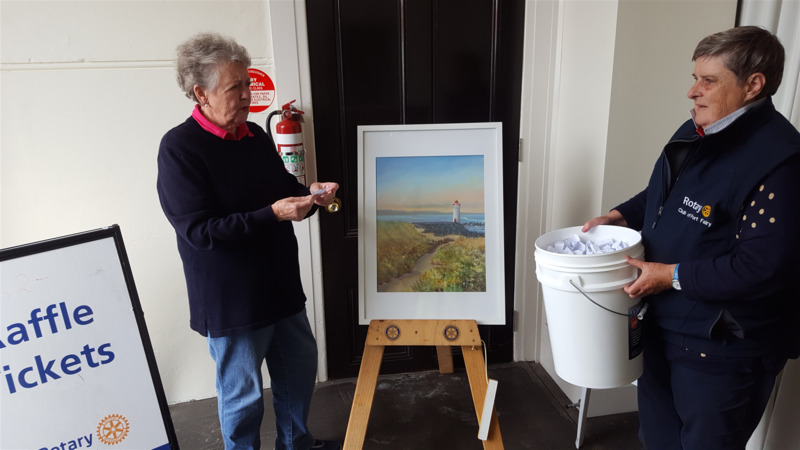 Rhys took home the prize - a painting of Port Fairy's iconic lighthouse by prominent local artist Wilma Preston. The raffle raised over $1600 for the Club's charitable causes. Come New Years Eve and Port Fairy Rotary gets involved in the town's annual Moyneyana Festival. This year the Club hosted the backwards races for children in the morning and the inaugural baristas' race in the evening. 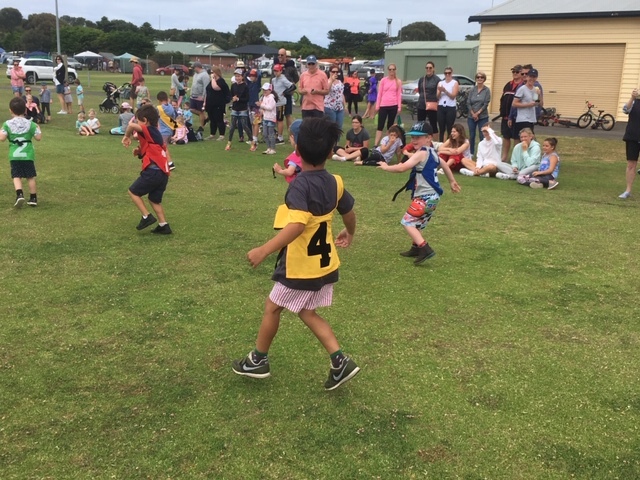 Over 60 children in four age groups had loads of fun running backwards on the cricket ground course, cheered on by families and friends. The baristas' race was held as a curtain-raiser to the Moyneyana float parade. The competitors represented various cafes and were challenged to reach the finish line while balancing two cups of coffee on a tray. The volunteer efforts of Port Fairy Rotary member John Clue have been honoured with a Paul Harris fellowship. The Paul Harris fellowship recognises outstanding commitment to the Club and the community. In presenting the honour to John at the Club's recent end-of-year event, President Sue Robertson said that John's work exemplifies the humanitarian and educational objectives of Rotary. She thanked him for his commitment to people in need both locally and around the world. 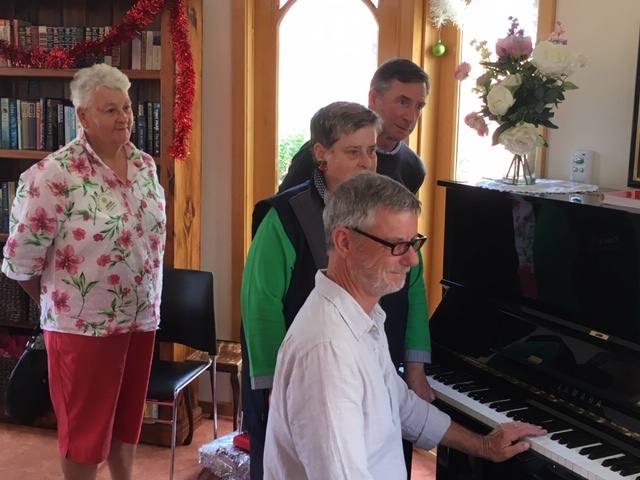 Moyneyana House has a brand new piano thanks to the Rotary Club of Port Fairy. The piano was handed over on 20 December by President Sue Robertson at a concert for Moyneyana residents held to mark the occasion. Several pianists displayed their musical talent and gave the new instrument a solid workout. Moyne Health Services CEO Jackie Kelly said that the piano was a great addition to Moyneyana House facilities. Sue Robertson and Peter Smith look on. 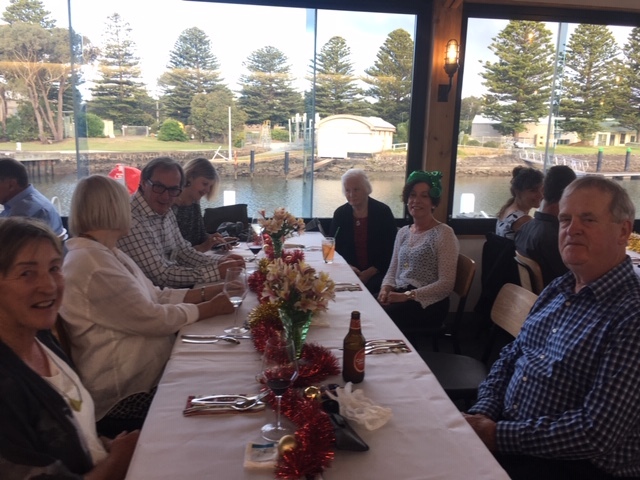 Members and friends of the Rotary Club of Port Fairy celebrated the festive season with a dinner at the Wharf restaurant. A good time was had by all at what was the last formal event of the year for the Club. The dinner marked a very active and successful year for the Club. 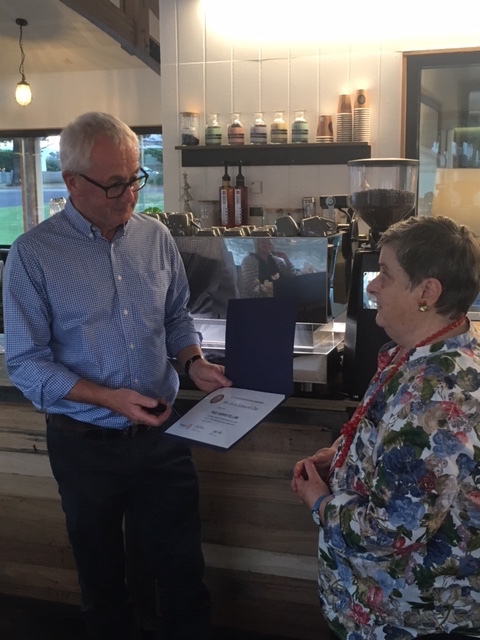 President Sue Robertson thanked members and friends for their tireless and cheerful efforts A highlight of the evening was the presentation of a Paul Harris Fellowship to member John Clue (see story above). The Friends of Port Fairy Rotary have proved that you can help the community and enjoy yourself at the same time. Established in 2016, the Friends group has grown to 20 members and is now an important part of the Rotary's service in the local area. The Friends contribute to a broad range of Club activities and enjoy participation in the Club's social events. 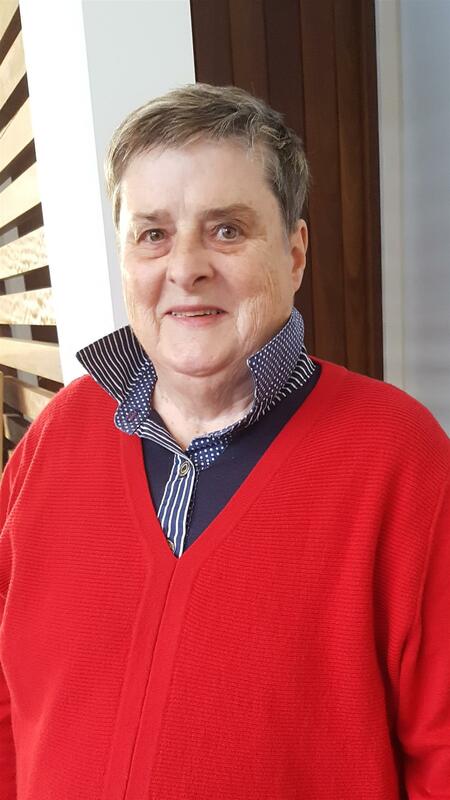 Rotarian Margaret Whitehead is the co-ordinator of the Friends group and is responsible for membership and liaison between the Club and the group. Moyne Health Services has been in operation for more that 160 years providing the community healthcare needs in Port Fairy and surrounding districts in the Moyne Shire. The CEO of Moyne Health Services (MHS), Jackie Kelly, was recently a guest speaker at the Rotary Club of Port Fairy. She spoke of the services offered by MHS and the plans for future development of the Service. The Rotary Club of Port Fairy's inaugural golf day was held at the Port Fairy golf course on 20 April. The day was judged a successful event by both players and volunteers who reported that the format for the day worked very well and all had a good time. President Bill Moore announced that the event raised $3500 which has been allocated to Rotary’s ‘End Trachoma by 2020’ program. There was great support from sponsors and we thank them for their assistance. Many thanks also to all who volunteered, especially Rotarians Adrian Crosier and Peter Smith, and Friend of Rotary Harry Bracegirdle. The catering teams and Brett Murray on the drinks cart did a sterling job. Players from the Grovedale Waurn Ponds Rotary Club had a successful trip down the highway to participate in the event. The Rotary Club of Port Fairy has been a long-standing supporter of the Bandari project in Tanzania. Rotarian Jo Levy recently travelled to Tanzania with a group of Bandari supporters from Port Fairy and other areas to participate in the latest development efforts at Mto Wambu, the former village of Port Fairy resident Seif Sakate. Meanwhile a fund-raising night held at the home of President Bill Moore raised $615 to purchase teaching resources for the Bandari School. This year’s trip provided professional training for teachers and the people travelling carried 60kg of teaching resources. Jo Levy reported from Tanzania on progress on the Bandari project. Rotarians and Friends had lots of fun recently when they tried their hands at an evening of lawn bowls at the Port Fairy Bowls Club. Guided by experienced bowlers Rotarian Brett Murray and his father Jim, enthusiastic players battled for the honour of 'nearest the jack'. While the 'bias' of the bowls proved a challenge for some, several Rotarians showed a hidden talent for the game including Jo Levy, John Clue and Peter Smith. The fun continued after dinner in the Clubhouse with a trivia quiz. Many thanks to Margaret Whitehead and her crew who put the evening together. Members of the Rotary Club of Port Fairy were deeply saddened at the passing of Past President and Paul Harris Fellow (Sapphire Pin) Colwyn Martin on 5 January 2018. Col was a club member for 27 years and was the Club's oldest member. Many Rotarians from Port Fairy and neighbouring clubs attended the farewell service at St Johns Church Port Fairy. The Rotary Peace Choir sang at the service and Rotary Club and RSL members formed a guard of honour after the service. Over the month of January, the Rotary Club of Port Fairy arranged tours to the Shaw River Buffalo Cheese farm at Yambuk. Proceeds from the tours went towards the End Polio project. The Club conducted five visits to the Shaw River Buffalo Cheese farm for a total of more than 80 people. Over $1000 was raised for the End Polio project. The Club gives special thanks to the Haldane family for their generous hospitality and assistance with the tours. Thanks also to Rotarians Sue Robertson and David Digby who helped with the design and distribution of the publicity materials. The prize in Port Fairy Rotary's 2017/18 painting raffle has been won by local man Anthony Clifford. Anthony was thrilled to carry away the painting of the town's well-known landmark, the lighthouse. The raffle is a major fund-raiser for the Club over the summer period. President Bill Moore (shown handing the prize to the happy winner) thanked all who bought tickets and the Rotary volunteers who sold tickets. Many thanks also to prominent local artist Wilma Preston who painted and donated the prize. On 16 January Rotary Exchange students from District 9780 visited Port Fairy as part of the their mini-safari around the Western District. They were hosted by members of the Rotary Club of Port Fairy and while in town they checked out some of the town's famous attractions and joined Club members for a luncheon at Rotary Park. On 30 October Harry Bracegirdle was made a Paul Harris Fellow in recognition of his outstanding service to Rotary and the community. 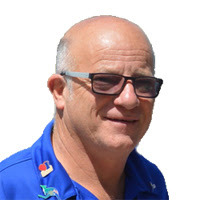 Harry joined the Rotary Club of Port Fairy on 13 October 2008 and served as a Rotarian for 9 years. During his time with the Club Harry undertook many important roles as a Club leader and member. 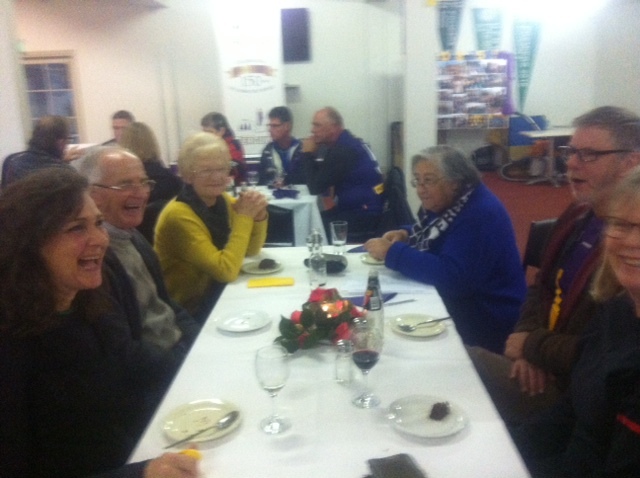 District Governor Ray Herbert recently visited the Rotary Club of Port Fairy. During his visit Ray met with the Board and attended our dinner meeting on 23 October. 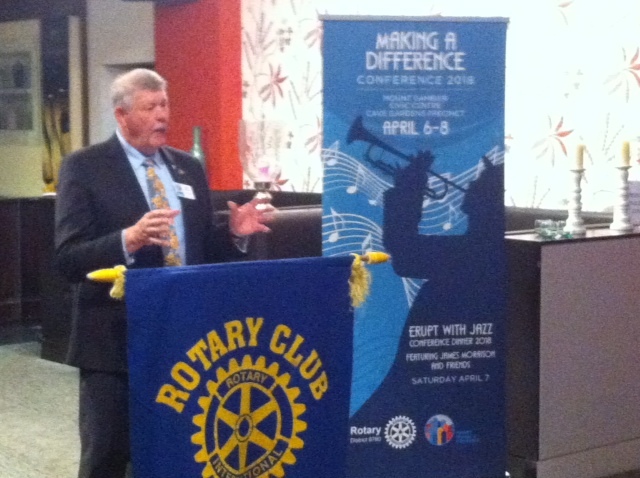 Ray’s visit was part of the District Governor’s annual tour of Rotary Clubs of District 9780. In his address to the Club Ray highlighted a number of the programs currently active in Rotary and acknowledged the efforts of the Rotary Club of Port Fairy. Port Fairy is a historic, intimate harbour village in the south west region of Victoria in Australia. The town is famous for its annual Folk Music Festival, held in March each year, which has been running for nearly 40 years and has expanded to include not just folk music but blues and roots music to suit all ages.